Archimago's Musings: MEASUREMENTS: Oppo UDP-205 Part 3: Jitter, some conclusions, discussions, and suggestions. We start with the USB DAC interface. Remember that these days, USB transfer happens asynchronously, which means that the Oppo (DAC) has the ability to tell your computer or streamer to start or stop audio data transfers as the "master" device. The data is buffered in the Oppo of course, and the DAC has access to the buffer's contents whenever it needs with accurate timing. Below are the Dunn J-Test results demonstrating the usual 16-bit and 24-bit jitter signals as measured through the stereo RCA, XLR, and headphone outputs from the device. Have fun pixel-peeping :-). Clearly there's no worry about jitter based on the J-Test results here. In fact, the results look remarkably clean within the limits of my Focusrite Forte ADC used in these measurements. The 229Hz square wave LSB modulation tone is easily seen in the 16-bit J-Test as expected given the high-resolution ability of this device. Minimal "skirting" at the base of the primary signal likely represents the limitation of the ADC more so than the DAC. Looks good to me... A tad more jitter than the stereo RCA output above but we're looking at sideband amplitudes 120dB below the primary peaks. I trust this would be outside the range of hearing even for "golden ears" out there. Remember folks, ethernet audio is asynchronous just like modern USB so I did expect good results. The data is buffered and jitter can be controlled very well as shown in the J-Test image. Remember back in the day before Y2K when CD and CD-R's were the only hi-fi digital game in town? Remember back then how certain subjective audiophiles would be obsessed about making sure music disks were burned at 1X, 2X or 4X speed thinking that higher speed burns would have all kinds of terrible effects on the jitter? Or how about the importance of gold CD's among other colors (like black) being desirable because of things like data accuracy and the jitter boogeyman? Alright then... Let's get serious with jitter. How about the old "synchronous" digital interfaces designed decades back? Note that I measured these through the XLR output to get an even better low-noise look. Clearly we have no worries here compared to the majority of devices out there. Very clean J-Test spectra! Again, I'm looking at the FFT through the XLR output. What can I say? It looks really quite nice again with no evidence of worrisome sidebands or significant noise otherwise. As far as I can tell, there is no need to fear that using HDMI input on this device would result in "jittery" audio output. Okay, this is rather unique to the Oppo UDP-205. Remember when we looked at the rear ports how there are actually 2 HDMI outs for this machine? One for the "Main" HDMI output which will typically connect to your receiver or TV. 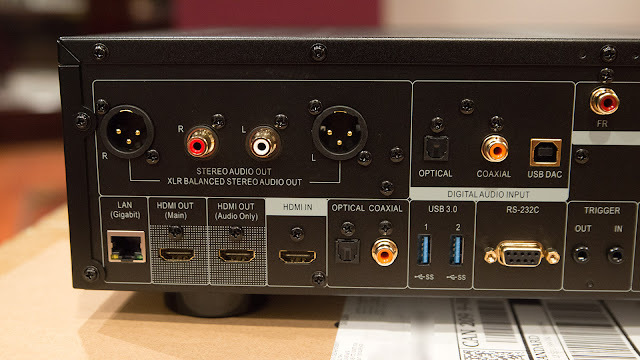 This one outputs in HDMI 2.0 standard and the other "Audio Only" port is meant to be even lower jitter HDMI 1.4 for audiophiles who demand better temporal accuracy connecting to an external DAC. While I can get ethernet, HDMI and S/PDIF audio inputs to be sent out through those HDMI outputs, USB audio cannot be sent through HDMI out. I suppose this is because the USB DAC portion is somewhat autonomous. Therefore, I'll use the coaxial output from my Squeezebox Touch (with EDO plugin) to connect to the UDP-205 and send the HDMI outs to an external "DAC" for measurements. This marks the end of the "trilogy" of posts on the objective measurements of the Oppo UDP-205 4K UHD Blu-Ray player with its plethora of features to satisfy the demanding audiophile (and videophile although for 4K/UHD video the UDP-203 is good enough). Across the board we're seeing exemplary performance from this device in audio performance whether it be the range of well-behaved non-overloading filters, high resolution with remarkable low noise floor, low distortion, and clearly inaudible jitter across inputs and outputs. A well engineered piece of gear that IMO puts many much higher priced items to shame. Admittedly, there are a number of other measurements I can make. For example, we could look at DSD playback at some point. I didn't bother double checking that the noise floor remains low with 352.8kHz+ sample rates. And maybe it's worth having a look at the MQA performance. Maybe :-). Subjectively, I've mentioned a few times already through these articles that I believe the UDP-205 produces "transparent" sound. Most of the time, I paired the UDP-205 with my usual set-up through the Emotiva XSP-1 pre-amp, to Emotiva XPA-1L monoblocks into the Paradigm Reference Signature S8v3 speakers for listening with and without DSP room correction. Yes, Nat King Cole's vocals from The Very Thought of You (Analogue Productions SACD, DR14) was velvety, nuanced, and compelling in highlighting one of the most gifted vocalists of the 20th Century. James McMurtry sounded punchy and raw on the album Live In Aught-Three (DR8) despite what I believe was overuse of dynamic compression. Modern productions such as Camila Cabello's Camila (DR6) sounded like, well, a modern pop album with the usual extensive mid/side processing to expand the stereo image, lots of digital sounds and DSP manipulations. Digging into the older catalogue, Ernest Ansermet's The Royal Ballet: Gala Performances (DR12, 2009 Remaster) sounded great with excellent musicianship on display and remains very enjoyable though the limitations of the 1957 analogue capture could be easily discerned through modern digital reproduction (obvious elevated noise floor, audible distortions here and there with some of the instruments and loud passages). The Bucky Pizzarelli Trio's Three For All in binaural (DR18, 2014) was a real hi-res treat especially over my Sennheiser HD800 'phones; every pluck of the guitar, every strum, every foot tap (eg. on "Body and Soul") easily discerned. The UDP-205 literally does not miss a beat and provides the technical chops to deliver all that was recorded on your digital source. Obviously, I love the music played through this device and have no problem engaging emotionally (IMO emotional engagement is more about one's natural inclination towards the artists and music than the device itself!). 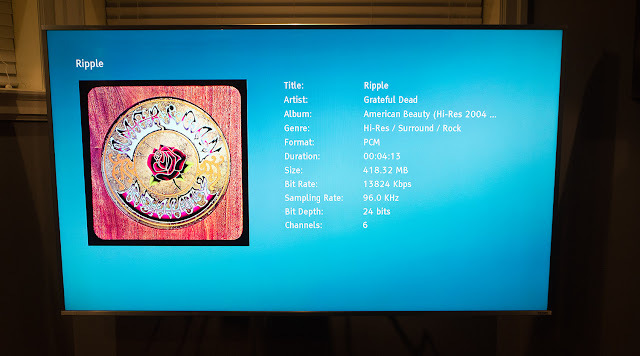 As you can see in the image above, I'm playing the song "Ripple" (ripped from the Grateful Dead American Beauty DVD-A) as 5.1 24/96 audio over DLNA/UPnP through ethernet from JRiver 24. This works quite well and I can easily control the playback with the free Gizmo app with my Android device. However, DLNA/UPnP is not gapless. This is a bit of a problem which I can overcome with having my Raspberry Pi 3 "Touch" playing off LMS for stereo music at least. It is unfortunate that Oppo has not changed the way it plays off the network as I'm sure there have been requests for gapless network playback since BDP-105 was their flagship (at least the last 5 years). Personally, gapless network playback would have been worth way more than MQA compatibility. Oppo technical support has also said over the months that unfortunately Roon streaming will only support stereo and not DSD. Apart from bug fixes and UHD Blu-Ray updates as needed, I can think of a couple things that would be very nice for Oppo to implement in firmware if possible (after they fix the XLR issue with the current MQA beta firmware as discussed last time!). 1. How about using the front panel LED display to provide a little more information? For example, when using as a DAC, how about showing the samplerate? Like "USB IN 192kHz", "OPTICAL IN 96kHz", "USB IN DSD128", "USB IN MQA 88.2 / 352.8kHz" when the input changes, then scrolling this information when the screen saver is on instead of just the rather bland "SCREEN SAVER" text which is useless when playing USB or S/PDIF audio and the TV is off. A small touch that can also serve as a prompt to users to confirm that unexpected downsampling isn't happening... These small touches go a long way as I'm sure Oppo knows. With transparency of such a high degree achieved, it's really not 2-channel "sound quality" that should be the focus of the audiophile hobby going foward. There are really no issues to solve IMO when it comes to digital players and streamers other than improving convenience, reliability and lower cost. It's time to expand features that improve the immersion. Yes, I know that multichannel is hard to do well and many will not bother with it. But it is without doubt the "next level" of sound quality once an audiophile wants to go beyond the limits of the stereo experience. As one who aims towards the goal of "high fidelity" with associated expectations that a device be objectively accurate, I'm very happy with the UDP-205 for "reference" listening, knowing that as a digital source, it will neither add nor subtract from what's in the audio data. I must say that I would never consider doing any kind of "mod" to this device (eg. adding tubes or whatever to the analogue output stage) given the results I've seen. There's really no "improvement" that would enhance the transparency. In all likelihood, one would see an increase in the noise floor and reduced resolution. I know some people prefer a "warmer" sound, but in my opinion, that's simply damaging to the fidelity achieved; just add an EQ and tune to preference! Note that I have listened and measured the Oppo BDP-105 pre and post tube modding years ago; we'll talk more about this next time. It is unfortunate that Oppo Digital has decided to wind down operations. Presumably the "last batch" of these players scheduled for August 2018 will be the final opportunity to purchase one new. I think for audiophiles and videophiles looking for rational products that represent excellent value and quality engineering, the Oppo brand will be sorely missed. Looks like Qobuz hi-res streaming is coming to the USA... And it's based on FLAC. Wise. Will be an interesting battle for the lossless and hi-res market share between this and Tidal once launched. Anyone know if Qobuz is going to be available in Canada as well? Summer is here... Time to lay back, relax a little with a cold one, and enjoy the music of course. Depending on how things go around here with work, I might go on vacation for a little bit over the next couple months :-). Note the 5-18kHz frequency range I'm looking at. WaveSpectra maxes out at 131072 points. Yes, I could send the data offline for 1M+ point analysis but I figure the realtime result is more than good enough for the purposes of a consumer. On the Play/Rec tab, I have the Focusrite Forte using ASIO and 24/192, stereo recording (not shown). Have you ever considered incorporating Audio DiffMaker (http://www.libinst.com/Audio%20DiffMaker.htm) into you analyses? I’ve always thought that it might be an interesting way to evaluate two DACs against actual music, but I’ve never seen it used anywhere. Perhaps it is a pain to setup or has technical limitation as I’m no expert on these matters. Actually I see that you tried it back in 2013! It works but is a bit of a pain to get done because of the variability when recording from the analogue output so in order to improve confidence, it's important to run it a few times. Furthermore, it's a bit finicky with occasional crashes with limitations on recording length. If they improve and update it with some bug fixing, I think it could be used more. I see that it has been a decade since the last version! Diffmaker seems an abandoned project based on a now useless idea - measuring the difference between two files from looking at phase changes. As we are living in a world of AD and DA conversion, and this usually involves small and clearly inaudible phase shifts at the lower and higher end of the audio spectrum, Diffmaker can not give relevant information on the differences that really matter - audible ones. Hmmm, not sure if it's that useless. It does allow a level of quantification of differences using actual music rather than test signals. It certainly is a remarkably sensitive piece of software. I agree though that whether something is audible is a different beast. The threshold of audibility does need to be correlated with the DiffMaker "null depth" and this threshold will differ depending on all kinds of factors! Can you show the screenshots of WaveSpectra's settings so that I can use the same settings to compare my own measuerments with yours? Thanks. I've attached the information with screenshots above. The contrast between your review and the folks at, for instance, the diyAudio forum is amazing. If all one had was the DIY forum, you'd be led to believe the Oppo is a good consumer-level device, but they made a bunch of cost-driven short-cuts that completely hamper it from being a true audiophile-grade device. It's a 50+ page thread. I'll share some of what I think are the more interesting quotes in juxtaposition with Arch's objective test results. Hmmm. 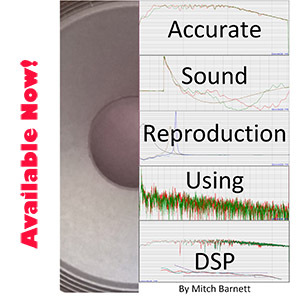 In the previous post Arch did find a 0.5 dB drop at 25 Hz... could this be what he is referring to? If it is, I think he's grossly over-selling it. And hey, did he let the stock caps fully burn-in? I've read cap burn-in is really important, usually taking dozens, but sometimes taking hundreds of hours. PS: I'm putting these into multiple posts so as not to trip the spam filter. Apologies if it's annoying to folks. Wow, given Arch's results, I'd have never expected that. I wish he was more specific. Here's a thought I just had: it's well-established tubes add a 2nd order harmonic which many people find more pleasant/warm sounding; many vinyl-philes also refer vinyl's more warm and/or "rounded" sound. Maybe what these people really like, what they are referring to as added "warmth," is background noise? "My appreciations are for an "out of the box" device. I haven`t even open it yet... I know already there are many enough areas to be modified, and improved. I`m also sure that all the outputs it will sounds much, much better. XLR it should be the best output, as functional concept, but for an untouched device, in my opinion the headphone it sounds best as line output. Again, assertion totally doesn't match Arch's measurements. I guess at least he's upfront with his biases and pre-conceived notions. But if one insists you have to replace the SMPS with a linear one because HF noise, well, I think you should have before and after measurements of the audio signal noise to show people. He doesn't. What he does have are before and after measurements of the rail noise. Obviously, those are not the same... but they are A LOT easier to show on a scope. "Have had my 205 for a week. Can confirm balanced out is harsh, compared to my TwistedPear BuffaloII Dac, on which I use balanced & unbalanced simultaneously to bi-amped speakers, balanced to mids/trebles, unbalanced to bass. TP B-II is same family DAC chip as in Oppo, & sounds much better, IMO. But I need Oppo for other features, so have to either change to unbalanced-only out, or fix the balanced outs. Is the Wima replacement mod simple, do they just replace Electrolytics with same value Wima MKP? And Coris, please PM me re: pwr supply. For the record, there's lots of ways to "color" a bi-amped solution without realizing it. OK, last one. I do give the DIY guys a lot of cred for putting their passion into action. They don't just cast stones. They actually rebuild their machines the likes of which hasn't been seen since Hot Rodders in the 50's. Such as replacing the multi-channel RCA outs with balanced XLR's... Pictures prove it happened. "Can you help me? I just replaced all caps in the analog board with same value and something happened. XLR out has not sound and L512 in the main board blow up. I test optical out and it has sound, haven't test HDMI out. Can you tell me what is L512? What to replace and how to fix? We double check caps in the analog board and nothing is short and looks fine so I don't know what cause this." Again, pictures prove it happened." I just wish they had some objective before and after results to share so that I could decide whether I'd find any of it worth all the effort. Ops. That should be "confirmation bias pile-on." Thanks for the posts Allan. Fascinating comments from the DIY guys. I would love to know what a before and after set of measurements would look like from these mods. Sure, people can have all kinds of expectations that this or that cap, resistor, fuse, power supply will lead to sonic improvement... That's fine if they have fun with it and it sounds good to them. But let's also check out the measurements to understand what has happened to the signal after the modification. We might find that through understanding the change in things like frequency response and noise level, what we learn is that some people might prefer certain kinds of coloration or distortions. And that's worth knowing as well since it can identify the psychoacoustic fingerprint of "euphonia". While I have visited this site before it was only via links posted in forums. This blog is now in my Google pane. Really like the straightforward, logical writing & POV here. I like content that rings true to me and my audio experiences while providing thoughtful, interesting topics. I posted the above. Figured out how to sign in via Google account. FWIW, I too own a pair of XPA-1Ls. Have you measured the UPD-203? It would be interesting to see the differences between the 205 and the 203, especially given the price difference. Anyway, my main reason for commenting is in hoping to draw on your experience with both the Touch and 205, as I search for the answer to another issue. Every now and then there will be an audible click/pop/blip - call it what you will. It never repeats at the same place in a track, so it's not a source file problem, and its location within the stereo field can vary, if this means anything. It happens when playing local FLAC files, from a Linux-based NAS which also runs the LMS, or streaming Tidal Hifi. Results are the same using coax or Toslink. This doesn't happen when substituting the aforementioned Pro-Ject DAC, or an older generation Arcam AVR, so it almost certainly relates to the Oppo or Oppo/Touch combination. Oppo service hasn't been able to come up with any reason for it, I wondered if your experience might suggest anything. Thanks.